Now I get to go exploring and walk on new ground. It is a beautiful walk, on the left side Loch Lomond and Ben Lomond the right, up the full eastern side of the Loch. I had driven many time the opposite side of Loch Lomond and had wanted to walk the bit that I could not get to by car, it had been a long time coming, and I was glad to be here; however as always with hikes like this my body was sore and took a while evry morning to loosen up. No matter how fit I think I am before starting any long walk, I find the truth after a day or two. 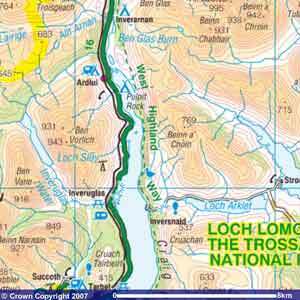 From Rowardennan to Inversnaid is 11km along the top end of Loch Lomond. If you are walking in high season, this will now provide a welcome relief from all the tourists and their cars. Shortly after leaving Rowardennan there is a choice of hiking routes. The higher route is by far the easiest. I have since walked along part of this again on the path that follows the side of the loch and I found it hard going and fairly muddy. The high route is along a forest track. Both route join again just after Rowchoish Bothy. Just before walking into Inversnaid you will cross the burn and have a great view of the waterfall there. There is a hotel at Inversnaid about 11km from Rowardennan so about half way through the day, therefore if you don’t have your own food with you for lunch it is a good place to stop for lunch. The other alternative that is the Inversnaid Bunkhouse – the Bunkhouse has now closed (Jan 2008), it is about ten minutes further on. They have a coffee shop and bar.